Éclairs are similar to the German version of Windbeutel because both are made from the same type dough. Bake them a day ahead before your guests arrive and glaze and fill them few hours before serving. Prepare the Brandteig (cooked dough) according to the basic recipe. After the dough has cooled make thumb size lines using a piping bag on a with butter greased and floured cookie sheet making sure the distance between each is large enough because Éclairs will double in size. Bake in a preheated (410-430°F) oven on medium or lower rack for about 30 minutes. Do not open oven in the first half time of baking! Éclairs should be light and hollow inside. If necessary 5 minutes can be added to the baking time after turning off the oven and while baking with open oven door. Protect Éclairs from any drafts and cut them lengthwise while they are still hot, let them cool. Fill with the crème, glaze the top with the coffee glaze. Let dry. Whisk the egg yolks with the sugar until foamy. Transfer to a medium sized pot. Split and scrape out the vanilla bean and add it to the mixture. Add starch, coffee extract, chocolate (optional), milk and mix everything together. Bring to a boil on medium heat while continuously stirring until mixture puffs up once, immediately remove from heat. Stir frequently until mixture is cooled. Remove the vanilla bean. Let gelatin soak in 2 tablespoons of coffee and let stand for 1 minute, add 1 cup hot water (short 2 tablespoons) according to package instructions, let cool to room temperature. Whip the cream until almost stiff, mix in the lukewarm gelatin and continue whipping. 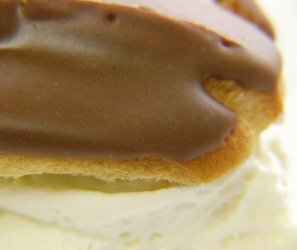 Fold in the stiff whipped cream (with the added gelatin) into the cooled Éclair crème. Fill the Éclairs with the crème using a piping bag. Refrigerate until ready to use. Alternatively they can be filled with a simple vanilla cream (made with 3/4 L / 3 cups milk) or a refined vanilla cream which is enhanced with 1/8-1/4 L / 1/2-1 cup cream.